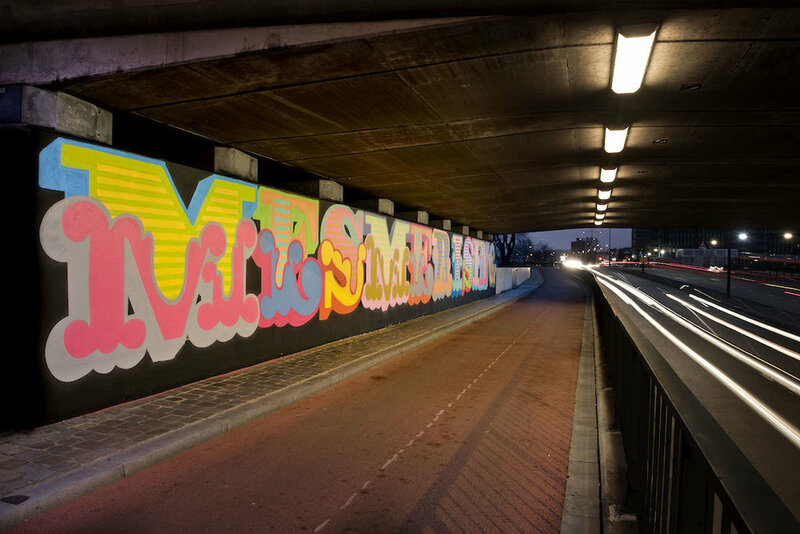 Ben Eine is one of the UK's most prolific and original street artists. Over time his style evolved to become what is today one of the most instantly recognisable and distinct street signatures; single letters and cryptic statements presented in bold colours all elaborately crafted from stylized fonts. Eine's striking typography has transformed streets around the world from London to LA, via Mexico City, Miami, Paris, Dublin, Tokyo, Stockholm and his current home in San Francisco. In 2010, Eine was catapulted to international fame when David Cameron presented one of his works to President Obama on his first official state visit to the White House. In 2011, Eine was included in the biggest exhibition of street art to date “Art in the Streets” at the Museum of Contemporary Art (MoCA) in Los Angeles. In 2012 Eine created his largest indoor installation to date, painted in The Lowry Museum in Manchester. Entitled ‘Communicate’ the 82 metre long statement read ‘To Express Thoughts or Feelings Easily and Effectively’. Critically acclaimed sell out shows in Europe and coast to coast in the US followed in 2012 and 2013, together with a commission from one of the world’s most desirable luxury brands, when Louis Vuitton invited Eine to design a limited edition fine art silk scarf. Copyright © 2019 Vroom &Varossieau. All rights reserved.